This article considers what makes Apple’s implementation of Fitzpatrick Scale Modifier problematic so that Chinese people criticize it. Judging from the published screenshot showing six skin tones, they obviously intend to describe Asian race by yellow. The excuse by Apple is farfetched. Whether you agree to the excuse or not, it lacks of reasoning. Where does the concept “yellow is ethnically neutral” come from? Is it really valid? People all over the world want to have emoji that reflect more human diversity, especially for skin tone. The Unicode emoji characters for people and body parts are meant to be generic, yet following the precedents set by the original Japanese carrier images, they are often shown with a light skin tone instead of a more generic (nonhuman) appearance, such as a yellow/orange color or a silhouette. When a human emoji is not immediately followed by a emoji modifier character, it should use a generic non-realistic skin tone—such as that typically used for the smiley faces—or a silhouette. Dark hair is recommended for generic images that include hair. People of every skin tone can have black (or very dark brown) hair, so it is more neutral. One exception is PERSON WITH BLOND HAIR, which needs to have blond hair regardless of skin tone. This take up the problem that some of the current emoji have too specific appearance. Unicode just specifies to be general such as happy person raising one hand or boy emoji, but they implement happy WOMAN raising one hand or WHITE boy emoji. It is too specific. So, Design Guidelines recommends to adopt neutral appearance regarding race, ethnicity, and gender. Emoji of Android already switched to generic one that is cartoonish or shows the contour. For example, the old boy emoji ( Boy Emoji) has light skin tone, while the new one shows the yellow mascot. The old one is specific. The new one is generic. In short, yellow is suitable for emoji as long as it makes the emoji generic. The Fitzpatrick Scale Modifier in draft introduces specific emoji regarding skin tones. It is, however, hard for users to recognize that there is the distinction of generic and specific, because they are evenly presented in emoji palette or in sentences. 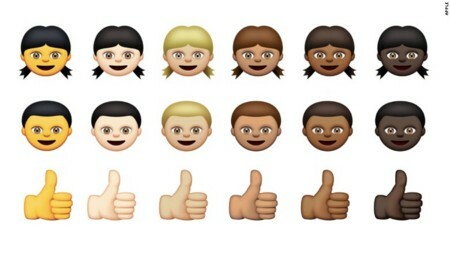 People may receive that Apple have just added new emojis for some emojis for skin tones. Again, let’s see Apple’s implementation. Unlike Android, they are still human and just differ on skin tone. The leftmost one should seem to be generic, but it is just yellow. It could be taken that “Ah, just turn the skin tone yellow, and it would be ok,” but this causes the mistake that yellow means Asians. Besides it, Apple emoji has another problem. The emojis applied Fitzpatrick Type-3 modifier have blond hair against the draft’s recommendation. The draft recommends dark hair that people of every skin tone can be have. Blond is associated with Caucasoid, so Japanese and Chinese take Type-3 emoji as white people. Most of Japanese have Type-3 or Type-4 skin tone*1, but Type-3 emoji is not “Asian.” It is natural that they concludes the yellow one is for Asian. Although there is a reason that yellow is ethnically neutral, Apple mistake the intension of yellow. Yellow does not always make emoji generic. The draft would be better to write clearly the knowledge.